The new Japanese prime minister must be feeling smug now that the Nikkei index has jumped by leaps and bounds at a time when other stock indices are sluggish. Has Shinzo Abe at last discovered the solution to the deflationary crisis which has plagued the nation since 1990? It's still early days. But Prime Minister Abe has delivered nothing other than bluff and bluster. Reality has to yet to sink in but if past precedents — the most famous being Reaganomics and Thatchernomics — of such word blending are any guide, then the Japanese people have been promised nothing but snake oil. The Japanese economy is in the doldrums for more than 20 years that any glimmer of hope is quickly seized upon lest it soon vanishes. Abe is taking the deflation bull by its horns when he promises to end deflation through massive deficit spending, money printing and deregulation. Many economists have applauded him for taking such a stance, in the hope that his success will prod the EU leaders to end their austerity programme. Abe's immediate apparent success as reflected in a 20% drop in the yen exchange rate and a 40% rise in the Nikkei index since assuming the premiership has given credence to his mission of trumping deflation. Abe is salivating at this prospect but reality will disappoint him. Abe was once an average prime minister who stepped down voluntarily. So why should he be different this time around? Of course he can avoid the musical-chair fate of his predecessors if he continues to strike a hardened attitude towards his similarly economically troubled neighbours over the disputed islands as a diversion from economic issues. We can pick holes in Abe's deflationary busting strategy but we will start by setting the record straight on the large fall in the yen exchange rate. Exchange rates are a puzzle to many simple because they're unpredictable. However ignoring the short-term fluctuations which are the outcome of speculative manipulations, exchange rates move in line with a country's current account balance. If a country's current account is increasingly in deficit, its exchange rates will soon drop unless that the deficit is sustained on increased foreign debt. Even then, in the long run its exchange rate will plunge if the current account remains persistently negative. The only exception is the US as it still is an economic and military superpower. The Japanese current account balance generally has always been positive (The Economist chart at left). Not shown on the chart are the CA deficits in January 2012 and from November 2012 to January 2013. The deficits were a result of the strong yen. It is therefore natural for the yen to devalue in order to restore the CA balance. In fact in February 2013, the CA account was back to surplus. So we can expect the yen to stabilise in the coming months. Any further devalution can be attributed to speculators expecting to make some quick gain. If we compare the above chart with the yen real effective exchange rate (left chart compiled from the Bank for International Settlements' data) we can discern two inversely opposed movements. 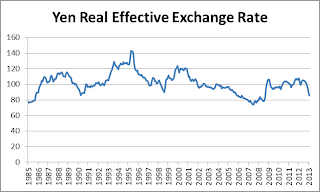 Note that an upward movement on the REER chart denotes an appreciating yen. The contrast may not be exact, at times with lags of 1 or 2 years, but generally the two charts complement one another in their contradiction. 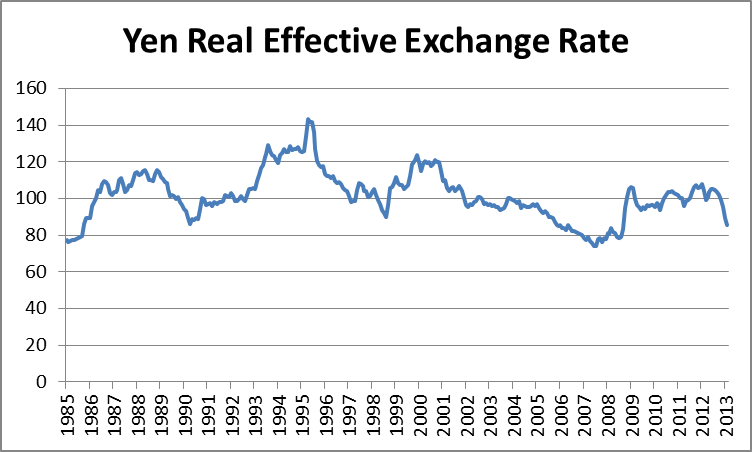 So despite what Abe has asserted, the yen exchange rate is outside his control. It was a mere coincidence that his tenure started with a drop in the yen value. The next question is can Abe engineer a continuing drop in the yen exchange rate and in the process reverse the Japanese deflationary environment? The Bank of Japan is committed to "printing" $1.43 trillion worth of yen. A comparison has been made to the situation that prevailed in 1920s Japan when Japan was under the spectre of severe deflation. A new government assumed office in 1931 and Korekiyo Takahashi was installed as the finance minister. He undertook three steps: depreciated the yen by 50%, cut the official discount rate by 3%, and increased government spending by 5% of GDP. The spending was financed through money printing. The economy recovered but Takahashi was assasinated in 1936 when he tried to rein in military spending because like what Roosevelt went through, both governments had limits on deficit spending. Only WWII saved both governments from hurtling back into depression. To find out whether a similar prescription would be successful in the current crisis, we will revert to our usual patterns for guidance. We will rely on the 4C framework as well as the economic trilemma in which a country's leader can choose only two options out of three, to wit, a fixed exchange rate, an open capital market and an independent monetary policy. Takahashi chose the first and the last. He imposed capital controls on currency movements. Shinzo Abe and Haruhiko Kuroda, the new BOJ governor, have not chosen any two. They will probably stick with the status quo, thus ensuring that their fate will be at the beck and call of economics. As for the 4C, the two critical components are capacity and consumption. In respect of capacity, the whole world is suffering from severe excess. But for consumption, it's a case of too little. The chart below from dalmady.blogspot.com shows that in the 1930s, Japan was still experiencing growing consumption from a burgeoning population. But its population peaked in 2005 and has been both declining and growing older ever since. This chronic excess capacity and low consumption means that Japan, and soon many others, cannot avoid the deflation trap. Unlike other variables, you can't reverse population trend on a dime; even now you can predict what'll unfold 50 years hence. We also can make an educated guess on the impact of Abe's massive spending and money printing. Abe's massive spending, not money printing, mind you, will create money which will circulate in the economy. As Japan has massive capacity, most of the money will most likely go to the local winners of the economic game (remember our Monopoly board game). They will surely not consume the money but invest it in real estate or foreign bonds — though it is arguable whether this is possible when other countries are reducing their CA deficits. The same scenario is unfolding in the US. What Japan will end up with is a real estate bubble or a massive holding of foreign bonds. Inflation if any will be very low. This wealth will be wiped out once the bubble bursts which it will because the assets will not generate any income when wealth remains stuck with the winners. As for deregulation, the third leg of Abe's planned reform, it'll make wealth accumulation more lop-sided. In deflation, you don't need the economy to be more efficient through free trade and deregulation. Instead you must make it more inefficient, the purpose being to give the losers more opportunity of earning income. It sounds ridiculous but if you take a leaf out of ecology, you'll find that only with isolated niches can species proliferate (see Worry not global warming but fear globalisation). The only way for Abe to generate high inflation is if the country's capacity is wrecked so that more money through massive deficit spending is not matched by increased goods output, as experienced by Zimbabwe under Robert Mugabe. The yen exchange rate will plunge and nobody would want to touch the yen. But on the positive side, Japan's humongous debt which in 2012 was 233% of GDP will be wiped out. Japan can then rebuild its economy based on the new technology of the Fifth Kondratieff Wave. This is only wishful thinking because absent a major destructive war, such a scenario is unlikely to happen. 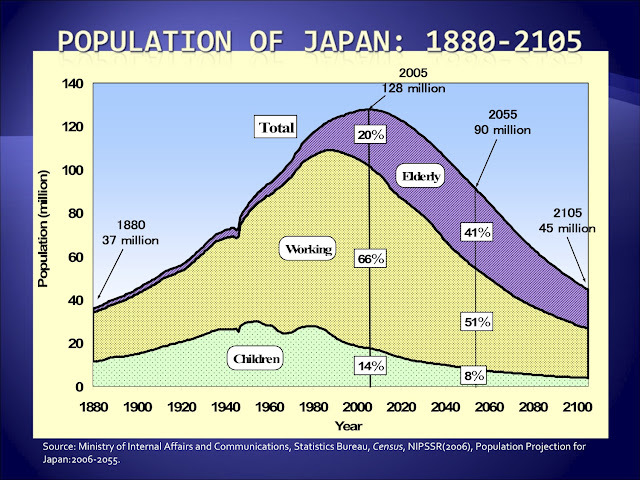 More than just prognosticating on the future of Japan, what I'm trying to illustrate with this post is the power of using pattern recognition rather than shallow analytical thinking which is characteristic of the assumptions used in many economic models. I've read through many articles of brilliant economists on Abenomics and they all came to the same conclusion, that is, the yen would significantly depreciate and Japan's economy would thrive. What damage have the mathematical models done to their brains? To prove that mathematics matters little in developing ideas, you should read this interesting Wall Street Journal op-ed piece by E.O. Wilson, the famous biologist.